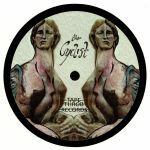 Review: The Cyclist fires up his Tape Throb label for a sixth instalment of grubby, wayward sonics that pivot around a danceable axis while reaching to a higher plain of musical expression. There are plenty of psyched-out overtones bursting out of "Requite", and there's a rugged groove cutting its way through the dense thicket of ferric noise. "Chime" has a more tender approach in some regards, sporting a tropical lilt and sparser arrangement, but there's still plenty of space for artful distortion. "Brave New Wave" is a brilliant mish mash of peppy electro, early synth pop weirdness and that overall Cyclist sound that only he can conjure up. "Mackabee" goes in on that particular quality to finish the EP off in an evocative ambient lick sending out an SOS across a shoreline of grubby, tidal dub washes.